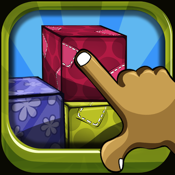 Let’s move Boxes is an awesome box puzzle where you have to group similar boxes. The boxes are all scattered in the screen and you need to arrange them in a line to group and crumble. You have limited moves in each level and have to clear all the boxes to move to next level. The complexity will increase as you go to higher levels. It is surely a brain rattler game and all you need to do is to think logically before you make your moves. Since you have limited moves, any wrong move will cost you a game.